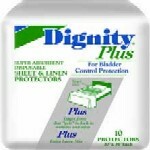 Maximum Protection without the rustling sounds usually associated with disposable underwear. The Premium DayTiime Disposable Absorbent Underwear provides the highest level of absorbent protection for active daytime use. They have the trim look of underwear and are easy to pull up and down. The breathable outer layer is made of superior, nonwoven fabric. This supple softness enhances comfort. This cloth like outer layer is silent. The peach colored mat inside is a contoured absorbent core that guarantees the maximum protection. The peach mat pulls moisture into the mat and away from your skin. It neutralizes urine, inhibiting bacterial growth and reducing odor. The pant is made from a soft, breathable fabric. The DayTime provides an ample, full rise waist panel for custom fit. Although the pants are pulled up and down just as standard underwear, the Premium DayTimes have the added advantage of "tear-away" side seams for quick and easy removal. You will be able to tell the front from the back of the pant as the waistband in the back is colored blue. The inner leg openings are cuffed with Kufguards for leakage control and bowel containment. The leg gathers are made of Lycra® for comfort and freedom of movement. The front, back and the size are clearly printed on each pair. A blue waistband also indicates the back of the underwear. The Premium DayTimes are available in three sizes from medium to extra large. The sizing is based on whichever (waist or hips ) is larger. Sold by the Case, call for a sample! 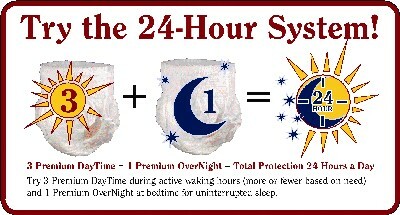 Click the 24 hour System to view the Premium OverNight Disposable Absorbent Underwear. 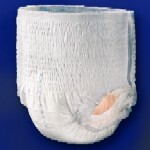 "Best Performing disposable absorbent underwear! The Peach Mat absorbent core guarantees maximum protection for uninterrupted sleep, and holds over a quart of liquid. The soft, breathable fabric has an ample, full-rise waist panel." 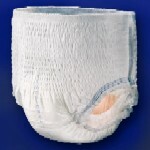 Absorbency Rating: Heavy to Full Protection in a premium full (fluff) incontinence brief for complete protection and a secure fit. 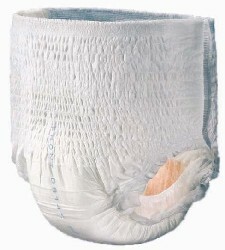 This incontinence brief is used when full bladder and bowel containment is needed.